The University of Wisconsin-Madison electrical and computer engineering Professor Zhenqiang "Jack" Ma developed two imaging technologies sponsored by DoD. With $750,000 in support from the Air Force Office of Scientific Research (AFOSR), Ma has developed curved night-vision goggles using germanium nanomembranes. Creating night-vision goggles with a curved surface allows a wider field of view for pilots, but requires highly photosensitive materials with mechanical bendability-the silicon used in conventional image sensors doesn't cut it. Instead, Ma's design employs flexible germanium nanomembranes: a transferrable flexible semiconductor that until now has been too challenging to use in imagers due to a high dark current, the background electrical current that flows through photosensitive materials even when they aren't exposed to light. "Because of their higher dark current, the image often comes up much noisier on germanium-based imagers," says Ma. "We solved that problem." Ma's dark current reduction technology has also been recently licensed to Intel. In another imaging project, the U.S. Department of Defense has provided Ma with $750,000 in support of development of imagers for military surveillance that span multiple spectra, combining infrared and visible light into a single image. Ma will employ a heterogeneous semiconductor nanomembrane, stacking the two incompatible materials in each pixel of the new imager to layer IR and visible images on top of one another in a single image. The result will be imagers that can seamlessly shift between IR and visible images, allowing the picture to be richer and more quickly utilized for strategic decisionmaking. "They are looking for the highest resolution they can get," says Ma. "Something that can take one picture with everything in it." Omnivision's patent application US20120319242 "Dopant implantation hardmask for forming doped isolation regions in image sensors" by Duli Mao, Hsin-Chih Tai, Vincent Venezia, Keh-Chiang Ku, Yin Qian, Gang Chen, Rongsheng Yang, Howard Rhodes talks about using hardmask for high-energy implants between PDs. The mentioned hardmask materials are silicon oxide and polysilicon. The application talks about openings of order of 0.2-0.4um with hardmask thickness of 2um, said to have enough stopping power for 1MeV boron implants (combined with photoresist). I'm a little surprised to see that the application was filed only in June 2011; I thought Omnivision has been using hardmasks since much earlier than that. 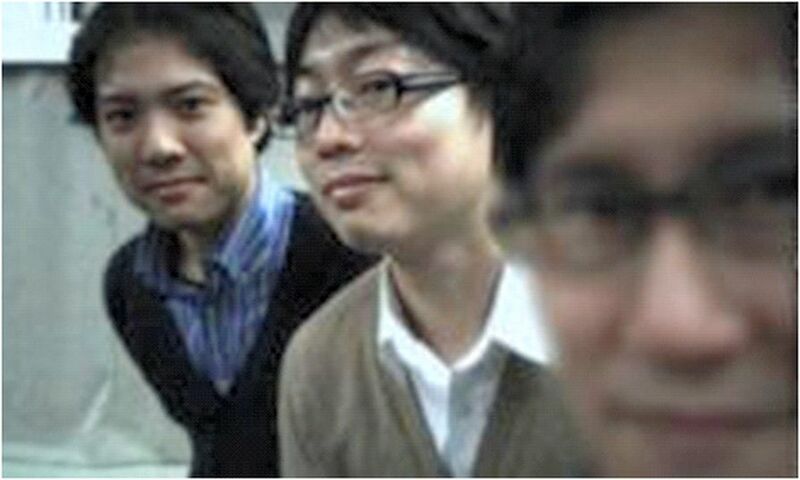 The Asahi Shimbun: Toshiba has developed a light field camera module that allow users to refocus any part of the photograph afterward, similar to Lytro camera. 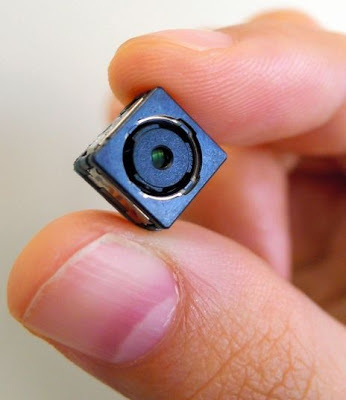 The cube-shaped module is about 1 centimeter per side and contains a dense array of 500,000 lenses, each 30um in diameter, in front of an image sensor measuring 5 mm by 7 mm. Each lens captures a slightly different image from one another, and the camera is said to produce a large, complete picture by using original software to combine the 500,000 tiny images. The new camera is said to be able to measure the distance to an object based on the differences among the small images. It can also create pictures that are focused on every single part of the image. The camera module can also be used to take videos, and allow the users to retain the image of a figure in the foreground while replacing the background. Toshiba plans to commercialize the module by the end of fiscal 2013 (March 2014), and call on smartphone manufacturers and other companies to adopt the technology. PR Newswire: TI enters ToF 3D sensing market through licensing of Softkinetic's DepthSense pixel and sensor technology and iisu middleware for gesture recognition. 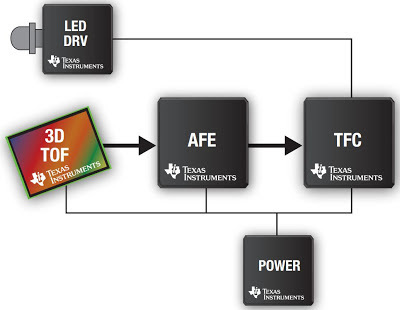 TI opens a special web page devoted to its 3D ToF imaging solutions. Mitch Reifel, Softkinetic's VP Sales, says: "TI has licensed SoftKinetic’s TOF pixel technology and has entered the TOF market with their own branded sensors (similar to an ARM licensing model). TI will also supply various chips around the sensor (power management, etc.) to provide a complete TOF system. The goal is obviously high-volume consumer electronics, where TI can leverage its large-scale manufacturing to bring down costs. ...we licensed our core pixel technology to TI, who will now manufacture and sell sensors (and support chips like a TOF controller) under their brand name. ...They will be combining this into a more integrated system over time (i.e. fewer chips), as well as adding other technology they have in the TI portfolio. Moving forward TI will provide a portfolio of sensors (they are announcing two so far with this announcement) and companies can go to TI for custom TOF chips, different array sizes, etc. This model means that SoftKinetic is no longer a direct provider of TOF chips, but rather a technology licensing company for TOF technology." "There are a plethora of applications that can benefit from the accuracy and resolution of this technology," said Gaurang Shah, VP of Audio and Imaging Products at TI. "Imagine an end equipment designer tilting, rotating, compressing and expanding a new product in 3D to inspect and evaluate it on their PC before committing to a hardware prototype. We believe our collaboration with SoftKinetic will ignite more applications like this, and foster further technology innovation to simplify the way we interact with machines." 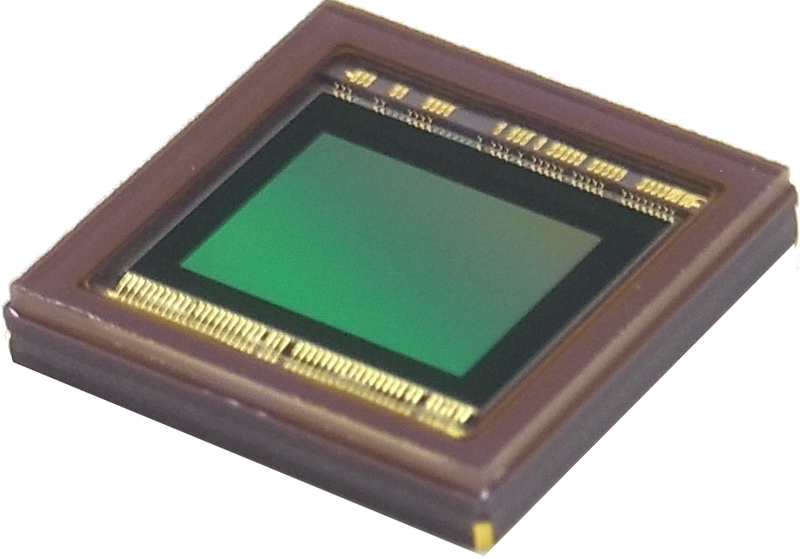 Business Wire: Toshiba announces a 20MP image sensor based on 1.2um BSI pixels, the TCM5115CL, aimed to DSC market and claimed to have the industry's highest resolution in 1/2.3-inch format. The new sensor is said to achieve a 15% improvement in full well capacity over Toshiba's previous generation 16MP sensor with pixel size of 1.34um. TCM5115CL delivers the high frame rates of 30fps at full 20MP resolution (10b RAW output), 60fps at 1080p and 100fps at 720p. 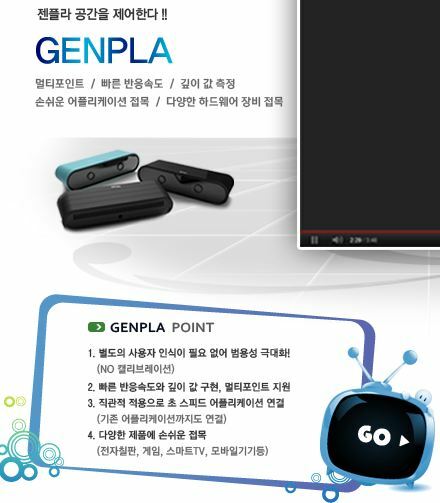 Sampling of the new sensor will begin at the end of January 2013 and mass production will follow in August 2013. CMOS image sensors are declared to be the main product of Toshiba's Analog and Imaging System business. The company's target is to reach a 30% market share in 2015. The previous plan aimed to achieve that target in 2013. I'm not sure what it means, but Panavision Imaging web site now presents itself as Dynamax Imaging. Update: I was told that Panavision Imaging has been sold on Dec. 18. Only about a half of the team got the offer to join the new company, the other half has been laid off. It's not clear who is the buyer. If somebody knows more details, please let us know. Luminous Landscape published a trend analysis of DxOMark sensor database by Peter van den Hamer. The analysis nicely demos a steady sensor performance improvement over the years. Some of the modern 1/1.7-inch and even 1/2.33-inch sensors reach the same aggregate score as DSLRs from 2003 - rather impressive progress. Business Wire: Aptina launches two fast 8MP sensors for mobile devices and sports cameras. The AR0835 targets the mobile device market, while the AR0835HS is aimed to sports camera market for very fast cameras with still and video capabilities. The new high-speed sensors enable the full-width 16:9 6MP video window to be readout at 60 fps without pixel binning or cropping the field-of-view. This 6MP data stream oversamples the target image by 3x resulting in video that is said to be as sharp as that of the high-end multi-sensor video cameras used in television studios. In addition, camera designers can take advantage of this speed to enable the capture of 6MP still images without interrupting the video stream and with zero shutter lag. "Aptina’s advanced A-PixHS technology takes the 1.4-micron BSI pixel to the next level with a high speed architecture that provides uncompromised image quality and very fast frame rate video," said Roger Panicacci, VP of Product Development at Aptina. The sensors’ other features include HDR capabilities in still and video modes; on-chip binning to provide 720p120; an optional on-chip scaler to reduce data transmission rates to enable operation with a wide range of image coprocessors, and slow-motion playback. Unique to the AR0835 mobile sensor is pin-to-pin compatibility along with a shared lens and lens placement to accommodate standard modules with Aptina’s 8MP AR0833. The video camera AR0835HS sensor uses a proprietary extremely fast (up to 32-lanes) HiSPi data interface while the AR0835 uses a 4-lane MIPI interface. The AR0835 is in mass production now, available in both die form as a stand-alone sensor, and with Aptina’s mobile ISP for a fully tuned, complete camera solution. The AR0835HS is currently sampling in a new 10mm x 10mm CLCC package and will be available in mass production in Q1 2013. Unfortunately in the late 1990’s and 2000’s black silicon was again produced as an effect of laser ablation and etching and consequentially some magical photoelectric properties were claimed by Prof. Eric Mazur and his students a Harvard University. One of the best examples of this is the 2006 paper by J.E. Carey et al. claiming a very high photo-gain associated with “the high density of impurities and structural defects in the microstructured layer.”  It turns out in retrospect that the high gain was probably associated with a bulk silicon photoconductive effect as a result of annealing the high resistivity float zone, FZ, silicon substrates at 700C to 800C resulting in conversion of the substrate to even higher resistivities by the introduction of oxygen donors. By their own admission there was a long period of time they could not duplicate the photodetector effects, presumably they had unknowingly changed to Czochralski, CZ , substrates that are lower resistivity and for which it is more difficult to form high resistivity substrates. All the results in their journal article  can be explained as photoconductors on high resistivity bulk silicon substrates with poor contacts. Photoconductors can have a very high photogain. The Harvard University and SiOnyx 2009 patent application  claimed a “photovoltaic effect” as well as the “high gain photodiodes.” Fig. 13 in their report supposedly demonstrating this photovoltaic effect has no photovoltage at zero current! By definition “photovoltaic” means some photovoltage develops under illumination of an open circuit connected semiconductor junction diode. It is also difficult to have “high gain photodiodes” unless you have some mechanism for carrier multiplication, but it is fairly easy to have high gain photoconductors , or even negative photoconductivity  ! Nature has been using the textured structures technology for probably millions of years. A moth’s eye has pillars on the surface of the eye, a texture, that reduces reflectance to one or two per cent. In the case of tropical butterflies mother nature is even more clever, the textured surface on their wings reflects polarized light that only other butterflies can see, to predators the butterfly is a green against a green background. The first human reference describing the textured structure and reduced reflectance as applicable to moths and applicable to solar cells is probably in 1935 by Von D. A. G. Bruggemann. He described one mechanism for reduced reflectance, a lowering of the average index of refraction making possible the use of antireflecting layers, partly of silicon, partly of air. Antireflecting layers with a lower index of refraction than glass are commonly used in eye glasses. Another effect to reduce reflection on solar cells was a large pyramid texture resulting in multiple attempts at transmission into the silicon. Front side texturing of photodetectors to reduce reflectance and increase the scattering of light in the substrate was described by Arndt et al. of COMSAT in 1975. Arndt described both the use of front side texture and antireflecting layers. Given that CZ silicon samples as are conventionally used in silicon processing do not provide high gain photodetectors then the increased absorption of CZ silicon devices in the infrared, but without gain, is easily explained by texturing of the black silicon surfaces. The idea of laser texturing of silicon surfaces in photodetectors was reported by Russell et al. in 1992  and then again in detail in 2003 . Yamamoto et al. have described in detail the experimental results of backside texturing of photodetectors  by laser ablation and we provided a simple analysis of their results by backside scattering of light in photodetectors . The net result is that all of the claimed phenomena for black silicon, reduced reflectance, increased absorption in the infrared as claimed by Mazur, Carey and the SiOnyx et al. can be explained by old phenomena commonly know to those skilled in the art of silicon technology. One skilled in the art will however soon appreciate that laser ablation introduces a huge number of defects and that it virtually impossible to anneal all of these out. These defects are particularly detrimental to photodetectors and solar cells so “black silicon” as described by Mazur, Carey, and SiOnyx et al. is simply not likely to be useful or employed in such devices demonstrating any utility. Textured devices produced by chemical etch, however, are useful and are commonly used in solar cells being sold commercially in the USA since before 2009. Recently there have been attempts to apply black silicon as the front side texture in solar cells, the first of these by the National Renewable Energy Lab., NREL,  used a porous silicon etch on the front side to reduce reflectance. However, while this works well in reducing the visible light reflectance of bare silicon wafers with no backside layers or materials from 46 % to a few % it is not clear that this provides any scattering of the light in the substrate. The texture comprises tall vertical structures, and 30% of the infrared light is still reflected. In a collaborative project NREL and Natcore developed the blackest of all black silicon, also known as the “Blackest Solar Cell” that absorbs 99.7% sunlight . A metal catalyzes used as a porous silicon etch creates millions of holes on the surface of a silicon wafer already having a large texture. Natcore provided the liquid phase deposited oxide to fill the holes for passivation of the surface. Even more recently SiOnyx used laser ablation  to create a fine texture on the front side of solar cells that already had an ISO texture ( isotropic – acidic textured) wafers  but this made at best only a 0.3% improvement in conversion efficiency. Texturing by chemical etch has also been previously disclosed for use in CMOS imagers. [25} However, the high density of defects introduced into the thin photodiodes by laser ablation  will result in a reduction in yield and increase in dark current and consequent loss of utility. Patents are supposed to benefit the public. The Constitution implicitly expresses this intent, the US Patent Office acknowledges this, and the Supreme Court has so interpreted it. Yet the current patent system fails miserably short of realizing this purpose. One example of the system's failure is the absence of a timely, inexpensive mechanism for invalidating the high number of bad patents being issued. As a result of this void, the public is suffering, and enormous wastes of expenditures of investor and public funding are incurred. There is as demonstrated by the previous example of “black silicon” a dire need for reform. The recent change by the America Invents Act in allowing an easier mechanism for third party submissions during patent prosecution  is a first step in this direction. * Leonard Forbes is a semi-retired Professor and is currently America’s most prolific living inventor in electrical sciences and technology. Z. Huang, J.E. Carey, M. Liu, X. Guo, J. C. Campbell and E. Mazur, “Microstructured silicon photodetector,” Appl. Phys. Letters, vol. 89, 033506, 2006. "Silicon-based visible and near-infrared optoelectric devices." S. M. Sze, “Physics of Semiconductor Devices.” Wiley Interscience, New York, 2nd Ed., 1981, p. 746. C-T. Sah, L. Forbes and W.W. Chan, "A New Model of Negative Photocurrent," Science Bulletin of National Chiao-Tung University, vol. V, no. 2, pp. 1-10, 1972. Von D. A. G. Bruggemann , “Berechnung Verschiedcner Physikalischer Konstanten von Heterogenen Substanzen,” Annalen der Physik, 5. folge, band 24, pp. 636-664, Sept. 1935. R. A. Arndt, J. F. Allison, J. G. Haynos, and A. Meulenberg, Jr., “Optical properties of the COMSAT non-reflective cell,” 11th IEEE Photovoltaic Spec. Conf., pp. 40-43, 1975. E. Yablonovich, and G.D. Cody, “Intensity Enhancement in Textured Optical Sheets for Solar Cells,” IEEE Transactions on Electron Devices, vol. ED-29, pp. 300-305, 1982. K. Yamamoto, A. Sakamoto, T. Nagano, and K. Fukumitsu, “NIR sensitivity enhancement by laser treatment for Si detectors,” Nuclear Instr. and Meth. Phys., vol. A624, pp. 520-523, 2010. PRNewswire: SMIC, China's largest and most advanced semiconductor foundry, announced it has a BSI CMOS image sensor "first test chip demonstrating good image quality even in low-light conditions". The complete BSI process has been independently developed by SMIC and is targeted to enter risk production with partnering customers in 2013. While driving its BSI technology toward commercial production, the company is soon to begin early development of next-generation CIS technology based on 3D integrated circuits. "We are proud to be the first Chinese foundry to successfully develop BSI CMOS image sensors," said SMIC CEO Dr. TY Chiu. "CMOS image sensors are among the key value-added technologies that SMIC offers for customers in the mobile device and imaging markets." "With this achievement as a stepping stone, our development team will drive the BSI sensor technology to timely commercialization," added Dr. Shiuh-Wuu Lee , SMIC's SVP of Technology Development. "This breakthrough further solidifies SMIC's position as the advanced technology leader in China." Since the introduction of its FSI CIS process in 2005, SMIC has become a major CIS foundry in China, primarily for mobile phone and consumer electronics applications. 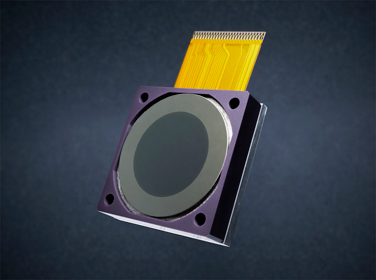 In order to provide turnkey CIS fabrication service, SMIC and Toppan Printing of Japan operate a joint venture, Toppan SMIC Electronics (Shanghai) Co., Ltd., (TSES), which fabricates on-chip color filters and micro lenses at SMIC's Shanghai site. A new PMD CamBoard video on Youtube demos extremely low latency (there are sequences recorded in 4x and 8x slow motion), good ambient light performance and efficient switching from low power mode to active mode. PMD combines it with face recognition to validate that a user is looking towards the screen to minimize the risk of unintended usage: An interaction is only possible if a face has been detected and a valid finger pose is observed. Apple applies for US2012/041398 (US20120314100) patent titled "Image Sensor Having HDR Capture Capability" by Michael Frank. "...there exist disadvantages to the process of generating a HDR image from multiple independently captured images. For example, changes may occur when images are captured successively such that a composite HDR image generated therefrom may not be completely aligned. This may generate motion artifacts in the composite HDR image. 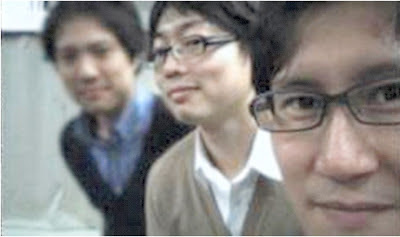 Further, the images may be affected by local motion in the image scene, e.g., trees swaying in the wind, people and faces shifting slightly, etc. Additionally, the time required for a HDR image to be processed may be delayed based on the images to be captured." "To generate a HDR image during a single exposure of the frame (i.e., fixed amount of time t during which the rolling shutter reset 80 moves across a frame), multiple reads of the same row of pixels of the image sensor may occur. For example, a first data read 86, of the data stored in a row of pixels, may be undertaken at a time n, where n is a fixed fractional time of time t. This time n may be, for example, 1/2, 1/3, 1/4, 1/5, 1/10, 1/20, or another value of the frame time t. This time n may be represented as line 88 in FIG. 5. That is, the first data read 86 may occur at a time n subsequent to the reset of a row of pixels by the rolling shutter reset 80. Accordingly, as the rolling shutter reset 80 passes downwards along line 78, the first data read 86 may trail the rolling shutter reset 80 by time n. In this manner, data stored in the pixels for each row of the frame may be read at a time n after the rolling shutter reset 80 of that row of pixels. Thus, each row of pixels read as the first data read 86 passes across the image sensor will have been exposed to light for the same time n, which may be referred to as an exposure time or integration time." While the exact reference escapes me, I've heard about a similar technique being used by a major security camera vendor for more than 10 years now. It might be new in a smartphone world though. "I am seeking some more ultra-motivated, highly innovative sensor engineers. 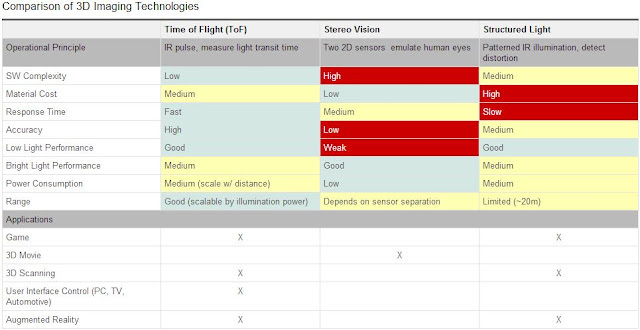 Some opportunities in characterization, validation, analog design, and architecture of all kinds of sensors. If you are passionate about sensing stuff and feel like you want to change the world, let me know." Will emerging technologies and new applications reshape the CMOS image sensors industry? Exploring the duality of image sensor and display technology development in 3D broadcast technology – experiences from the London 2012 Olympics and beyond..
Multi Aperture Imaging – why? And why now? There are also unnamed presentations by Rico Marchesi, VP Sales & Marketing, EPSROS PHOTONICS, Switzerland and Chris Yates, CTO, ODOS IMAGING, UK. Thanks to RS for sending me the info! EE Video Blog's Youtube video teardown of 1985 Sony CCD-V8AF-E 8mm video camera reveals that its CCD uses non-Bayer color filter. 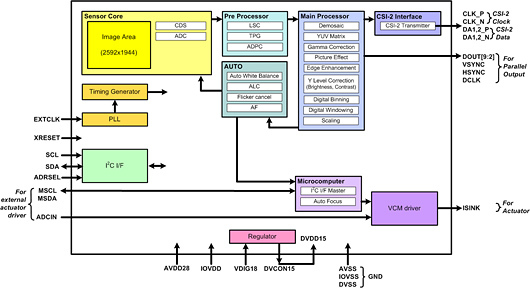 So, it appears that Sony F65, ClearVid and other non-bayer CFAs for video applications have a long tradition. I wonder if CMYG video sensors too had many different versions in production. Stanford University applied for a patent US20120307116 "Learning of image processing pipeline for digital imaging devices" by Steven Lansel and Brian Wandell. Abstract: "A learning technique is provided that learns how to process images by exploiting the spatial and spectral correlations inherent in image data to process and enhance images. Using a training set of input and desired output images, regression coefficients are learned that are optimal for a predefined estimation function that estimates the values at a pixel of the desired output image using a collection of similarly located pixels in the input image. Application of the learned regression coefficients is fast, robust to noise, adapts to the particulars of a dataset, and generalizes to a large variety of applications. The invention enables the use of image sensors with novel color filter array designs that offer expanded capabilities beyond existing sensors and take advantage of typical high pixel counts." PR Newswire: EETimes-China 11th Annual China Fabless Survey revealed that Galaxycore and Superpix are among Top 10 Outstanding Technical Support companies. Superpix made it for the second year in a row (see last year results). Galaxycore also won "2012 Forbes China Best Potential Enterprise Award". Talking about China-based CIS companies, recently Superpix announced its first 1.75um pixel design - the 2MP SP2518. Galaxycore announced its second generation 1.75um pixel sensor the GC2015. The first generation one was announced a year ago. Meanwhile, the third China's image sensor company, Brigates, launches its first sensor targeting high end security cameras, the MCCD-BG0601. Its IR sensitivity is said to be 3 times of that of CCDs. The D1 (PAL) resolution sensor uses 8.3um x 8.6um pixels. "In the CMOS image sensor market, SMIC’s key customer – GalaxyCore (private) – shipped around 600 mn units in 2011, an increase of 70% from 350 mn units in 2010. The majority of GalaxyCore’s CIS has resolution is under 2Mpixels and it mainly serves the China feature phone market and is preparing for higher-pixel products for the booming smartphone market." PR Newswire: Primesense announces its next generation embedded 3D sensor, Capri, demonstrating a small form factor and low cost. The new reference design utilizes Capri - PrimeSense's next-generation of depth acquisition SoC, with improved algorithms including multi-modal 3D sensing techniques. Its thin form factor is aimed to embedding in consumer electronics devices such as PCs, All –in-One PCs, tablets, laptops, mobile phones, TVs, consumer robotics and more. "Using cutting-edge technologies, our newest generation of sensors is robust, accurate and affordable," said Inon Beracha, CEO, PrimeSense. "With a mind-blowing size reduction, Capri's size is about x10 smaller than the PrimeSense's current generation of 3D sensors and it is certainly the smallest 3D sensor in the world. Capri is small enough to fit into today's most popular Smartphones while still providing the highest depth performance (short and long range). We see Capri adding depth sensing and Natural Interaction to numerous devices and markets, revolutionizing the user experience and usability in ways that no one could imagine until now". Samples for development and integration for OEMs will be available by mid-2013. EETimes: ST announces its restructuring strategy. When asked about manufacturing strategy, ST CEO Carlo Bozotti told analysts there is a three-legged manufacturing strategy for Crolles, all fundamental for the future of the company. One of the legs is CIS process – a part of ST's business that had been under a strategic review in 2010. At that time it had been decided to adopt a policy of application diversification and that this has been successful, Bozotti said. ST has multiple design wins in automotive and elsewhere, he added. 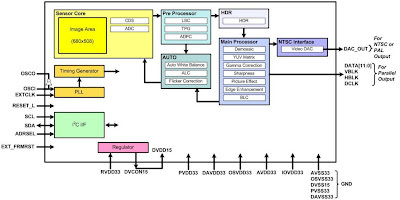 The other two legs are embedded non-volatile memory and FDSOI processes. Toshiba announces 5MP 1.4um pixel sensor with integrated ISP, the T4K39. The 1/4-inch sensor is intended for use in camera phones. Tech-On: NEC has developed an uncooled VGA IR sensor with pixel pitch of 12um. The sensor operates in 8-14um band, so its pixel size is less than one wavelength. The pixel is based on NEC's own MEMS technology. "In order for next-generation sequencing to become widely used as a diagnostic in the healthcare industry, sequencing instrumentation will need to be mass produced with a high degree of quality and economy. 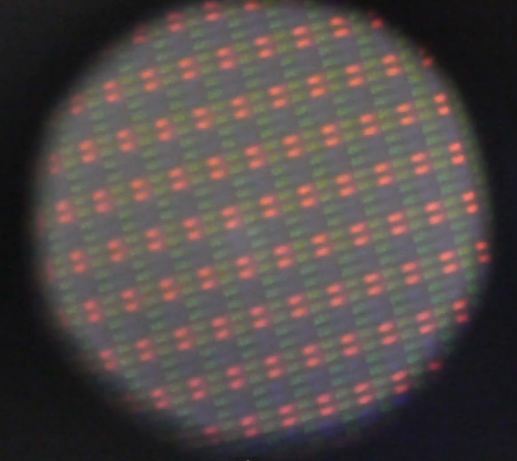 One way to achieve this is to recast DNA sequencing in a format that fully leverages the manufacturing base created for computer chips, complementary metal-oxide semiconductor chip fabrication, which is the current pinnacle of large scale, high quality, low-cost manufacturing of high technology. To achieve this, ideally the entire sensory apparatus of the sequencer would be embodied in a standard semiconductor chip, manufactured in the same fab facilities used for logic and memory chips. Recently, such a sequencing chip, and the associated sequencing platform, has been developed and commercialized by Ion Torrent, a division of Life Technologies, Inc. 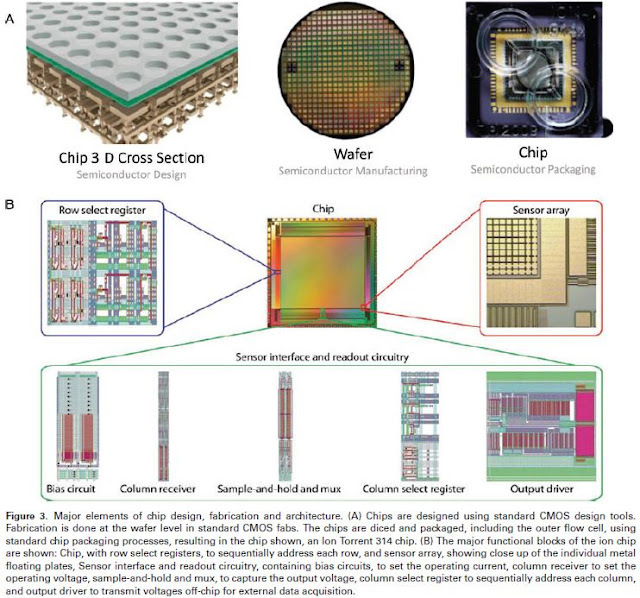 Here we provide an overview of this semiconductor chip based sequencing technology, and summarize the progress made since its commercial introduction. We described in detail the progress in chip scaling, sequencing throughput, read length, and accuracy. We also summarize the enhancements in the associated platform, including sample preparation, data processing, and engagement of the broader development community through open source and crowdsourcing initiatives." The progress of pH sensors is quite similar to image sensors: the resolution has grown from 1.5MP to 165MP (! ), while pixel pitch has shrunk from 5.1um to 1.68um leveraging process scaling from 0.35um to 0.11um. Everything looks familiar, except the price is much higher than that of image sensors, see the last comment to the previous post on Ion Torrent. Thanks to VZ for the link! Sofradir acquires Sagem and Thales’ IR detector technology development and manufacturing facilities. Under the agreement, Sagem will transfer to Sofradir the Indium Antimonide (InSb) technology. The Quantum Well-Infrared Photodetector (QWIP) and Indium Gallium Arsenide (InGaAs) technologies will be transferred to Sofradir from the GIE III-V Lab, an economic interest group with partners Alcatel Lucent, Thales and CEA. By consolidating these IR technologies under one roof, Sofradir joins a small circle of IR detector manufacturers with expertise in all the cooled and uncooled IR technologies. Sofradir is currently ranked number one for volume deliveries of IR detectors based on its Mercury Cadmium Telluride (HgCdTe) technology. "The technologies from Sagem and the III-V Lab enable Sofradir to have from this point forward the complete portfolio of infrared technologies," said Philippe Bensussan, chairman and CEO of Sofradir. "With the new technologies, Sofradir, along with its subsidiary ULIS, will be able to select the technology best adapted to our clients’ applications." Marketwire: NXP announces ASC884xA and ASC885xA series of single-chip video processors for HD IP security cameras. These devices integrate virtually all functions required for an IP camera design -- from raw image sensor data input, ISP, and H.264 compression, to secure encrypted transmission over the network through a Gigabit Ethernet interface. Capturing 60 frames per second at Full HD resolution (1080p/60), the new series supports H.264 High Profile encoding while consuming less than 1.5 W of power, said to be the best power efficiency and lowest bit rate compared to other solutions on the market today. Further, the ASC884xA and ASC885xA devices incorporate very flexible spatial and temporal (2D/3D) noise reduction for excellent low-light performance. In addition to ASC8852A flagship product for 1080p/60 performance, NXP is releasing a complete range of pin-compatible Advanced ICs down to 1080p/30 (ASC8850A) and 720p/30 (ASC8848A). The ASC8848A offers an H.264-encoded bit rate of less than 500 kbit/s at a power consumption level close to 0.5 W. Evaluation samples of the ASC8848A, ASC8849A, ASC8850A, ASC8851A and ASC8852A will be available to lead customers starting in Q1 2013, with volume manufacturing starting in Q2 2013. "After Qualcomm, the next best performance among the Top 20 suppliers is set to be posted by Sony, which will attain 20.1 percent growth in semiconductor revenue. 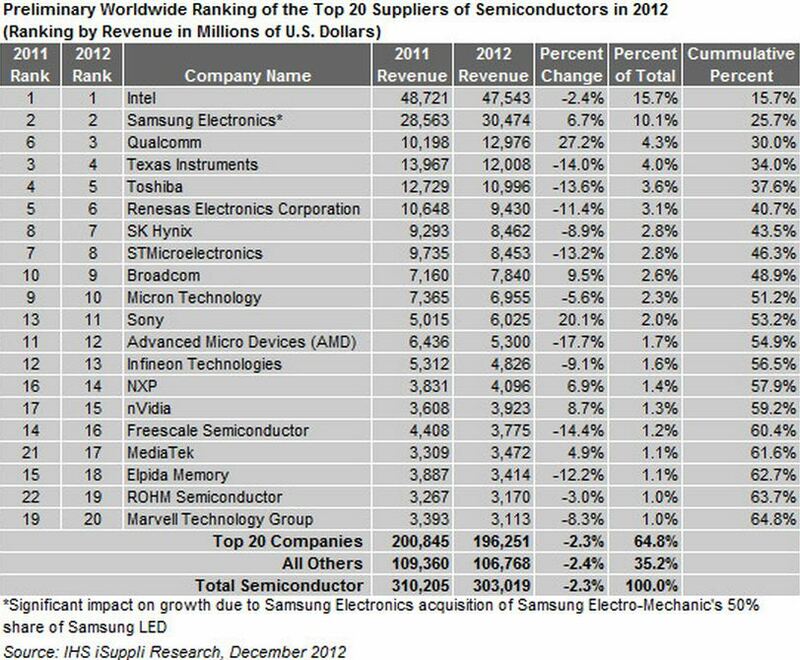 Sony's performance stands in stark contrast to most other major Japanese semiconductor suppliers, whose revenue will collapse by double-digit rates in 2012." "Sony's strong results are due to its leading position in the image sensor market, which is expected to grow by 19 percent in 2012, with the CMOS image sensor sector of the market seeing its revenue expand by 31.8 percent. Sony's image sensor revenue, which accounts for nearly 60 percent of its semiconductor takings, is expected to expand by 48 percent. 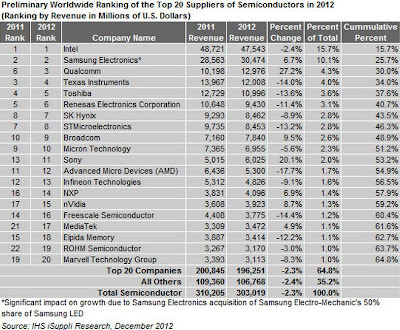 Even more amazing, its CMOS image sensor revenues are forecast to more than double," says Dale Ford, iSuppli's analyst. Marketwire: InVisage announces that it is a recipient of the Red Herring Top 100 Global award, recognizing the leading private companies from North America, Europe, and Asia. "This prestigious award reinforces the huge impact our image sensors with QuantumFilm technology will have on the industry at large," said Jess Lee, president and CEO of InVisage. "We appreciate the recognition, and are proud to be part of such an esteemed list of companies." PR Newswire: Toshiba announces its first image sensor for the automotive and security/surveillance markets, a 1/4-inch TCM5114PL VGA sensor with HDR and fast frame rates. "Toshiba is leveraging its industry-leading CMOS imaging technology into new markets with stellar results," said Andrew Burt, vice president of the Analog and Imaging Business Unit, System LSI Group at TAEC. "The low-power consumption, and rich imagery enabled by this device in various light conditions will appeal to manufacturers in the automotive industry." The TCM5114PL sensor delivers DR of 100dB at 60 fps at VGA resolution. The sensor is based on 5.6um pixel with > 6V/lx.s senstivity and has integrated ISP and HDR functions. The TCM5114PL has both a digital and analog (NTSC/PAL) interface so it can connect to currently available display panels. The device supports YUV422/RGB565/ RGB888/ RAW10/RAW12 data formats. Samples of the TCM5114PL VGA image sensor are currently available. Mass production is scheduled for March 2013. Sample pricing is set at $25. A pdf version of the presentation is here. Youtube version of the video is here.